Mayor Dan Gelber has taken on an ambitious project – trying to find a solution for what he describes as the “deserted” three blocks at one of the City’s gateways – the 500, 600, and 700 blocks of Alton Road and West Avenue, the site of the Old South Shore Hospital building which is now a skeleton that looms over the area. For the past several months, Gelber has convened a series of meetings with property owner and developer Russell Galbut and local residents in an effort to come up with a development plan that works for everyone. This week, despite dueling community meetings sponsored by Galbut and an opposition group, a compromise may be emerging. At his meeting with area residents, Galbut and his architect Raymond Fort of Arquitectonica presented three new options for the site in addition to one already approved which includes a series of low rise buildings covering the 600 and 700 blocks. The new options feature a tower on the 500 block of varying heights and a public park on land deeded to the City. “as many buildings as you can get on that site due to height restrictions”. The alternative plans, he said, create more open space which the current plan does not allow for. Option 1 (above) includes a 36-story tower on the 500 block, moving the square footage from two buildings approved for West Avenue to the tower while keeping the currently approved five-story building with ground level retail. This option includes 2.8 acres of public park and keeping the current South Shore Hospital building for office use. Option 2 (above) eliminates the old South Shore Hospital building and expands the first level commercial use of the building on Alton Road, while including the four levels of apartments over the retail space. Again, square footage moves to the tower on the 500 block which in this option is 42 stories in height. Fort said all of the options include a new 7th Street to allow more circulation around the block with less congestion backing up on the roadway. The western end of the property, along West Avenue, becomes a public park. Option 3 (above) features the tallest tower at 50 stories, eliminating the apartments on the building on Alton Road. In this scenario, the City receives nearly 3.5 acres deeded for a public park. 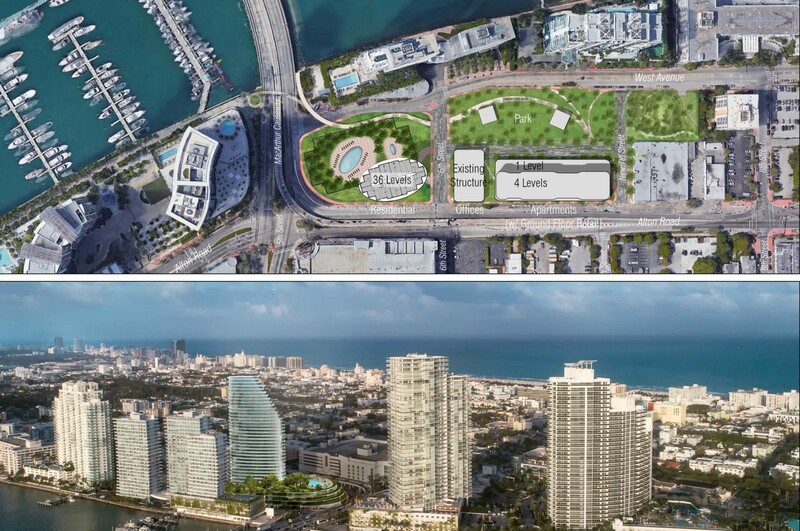 It also includes space to provide an additional lane that turns on MacArthur Causeway and “ramping space to get over West Avenue and potentially MacArthur Causeway to finally connect the Baywalk that is on the other side of the MacArthur Causeway,” Fort said. With larger units in the taller tower and the elimination of the rental apartments, Fort said this plan reduces the overall number of units on the site. Both Fort and Galbut emphasized that a tower and park are a less intense development than what is currently approved for the site. “The taller it goes, the less intense it is, which means less cars, less units, less commercial,” Galbut told the more than 200 people in attendance. Several residents raised concerns about the scale of a larger tower not being compatible with the neighborhood. Galbut responded it was in scale with the existing Floridian, Bentley Bay, Icon, and Murano Grande condominium buildings. “A community is defined by its cultural centers of excellence and its parks and recreational areas,” he said, arguing that the alternative plans with a park are an asset to the community. Edward Martos, attorney for the Floridian at 650 Alton Road, said the building is “one of the most directly impacted” and, therefore, has been speaking with Galbut for some time about his plans. He said the problem with the currently approved plan is that it creates “a transient community, a rental community” of 500 units. “We don’t want 500 more units.” He asked for a show of hands of those who would use the proposed park. Most in the room went up. “We’re strongly in favor of it for that reason. It preserves a residential community in the middle of a bustling city,” Martos said to loud applause. Having a tower of larger condos, versus a block of rental units, he said, would mean less traffic as buyers would be expected to be mainly out of town investors and those seeking winter homes. As to concerns raised by a few residents that the park would attract “vagrants and homeless”, Martos said having retail and restaurant uses on the park will activate it in a positive way. “Those shop owners will watch over that park and protect that park,” he said. “We can’t try to outlive all our problems, we can’t outlive all these developments,” he added. “Developers have a right to develop their property.” As to the park, he said, the City’s Park Ranger program will expand into it for security. “Think about what’s going to negatively impact you the least when it comes to traffic, when it comes to walking around the neighborhood,” he concluded. 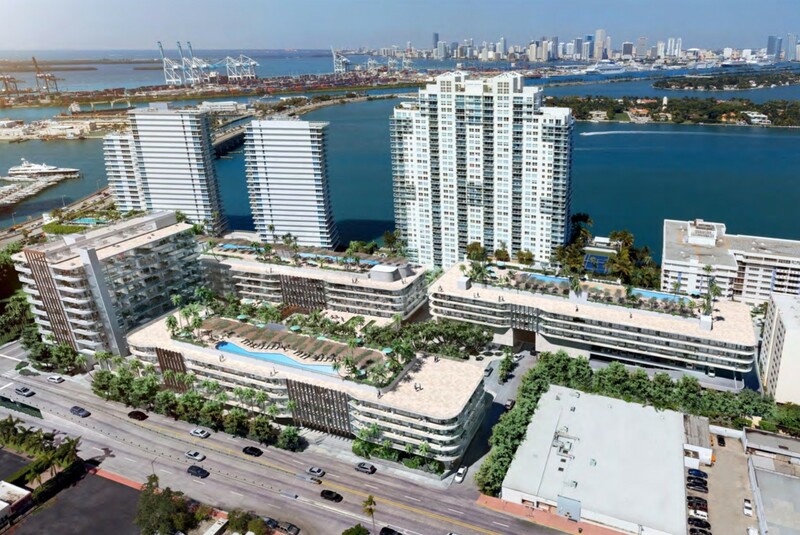 Dana Martorella, president of the Floridian Condominium Association, said when she saw the current plan, she went to Commissioners and said “I don’t know what you’re thinking. West Avenue can’t support something like this.” There is already a lot of traffic backing up onto West Avenue, she said. “Putting this density on those blocks terrifies me.” While the tower isn’t ideal, she said, it is better. “Be a part of the community, do something for the community and not for the profits,” she challenged him. 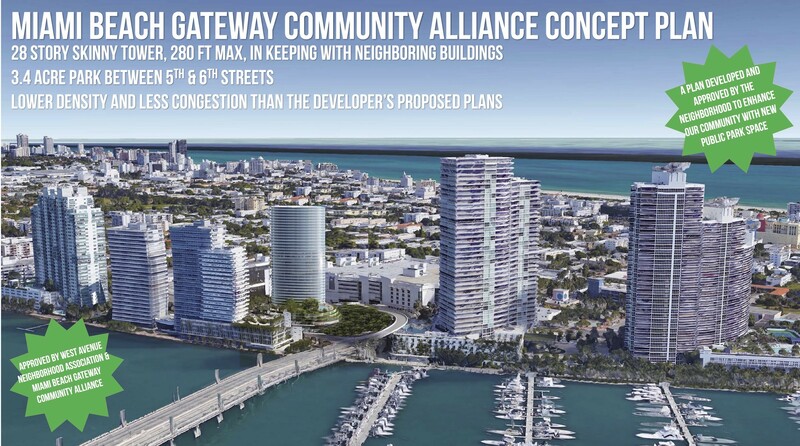 At the same time a meeting was taking place just two blocks away sponsored by the Miami Beach Gateway Community Alliance which, according to a press release, consists of the West Avenue Neighborhood Association (WAVNA), South of Fifth Neighborhood Association (SOFNA), and local residents. More than 100 participants listened to a presentation taking issue with Galbut’s plans for the site. 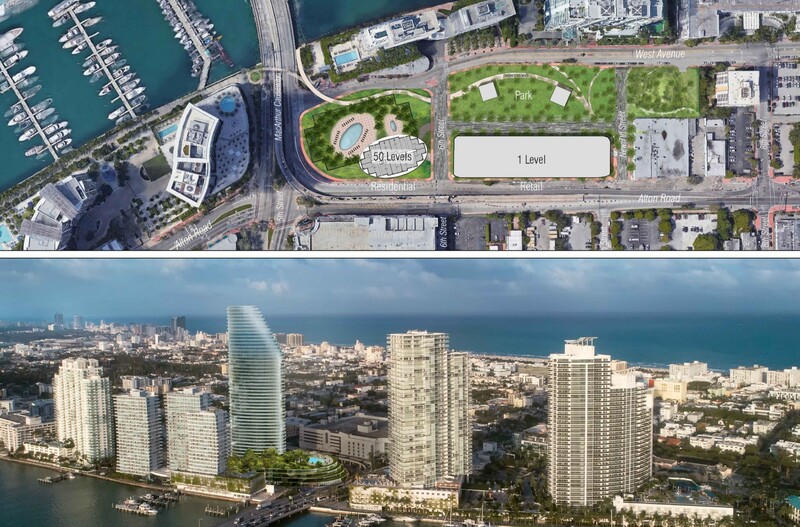 For the most part, the group’s desire for a 3.4 acre park deeded to the City and a “low-rise residential and/or commercial development on the eastern side of the 600-block" seems to be in line with Galbut’s plans, however, it only supports a 28 story tower on the 500 block. 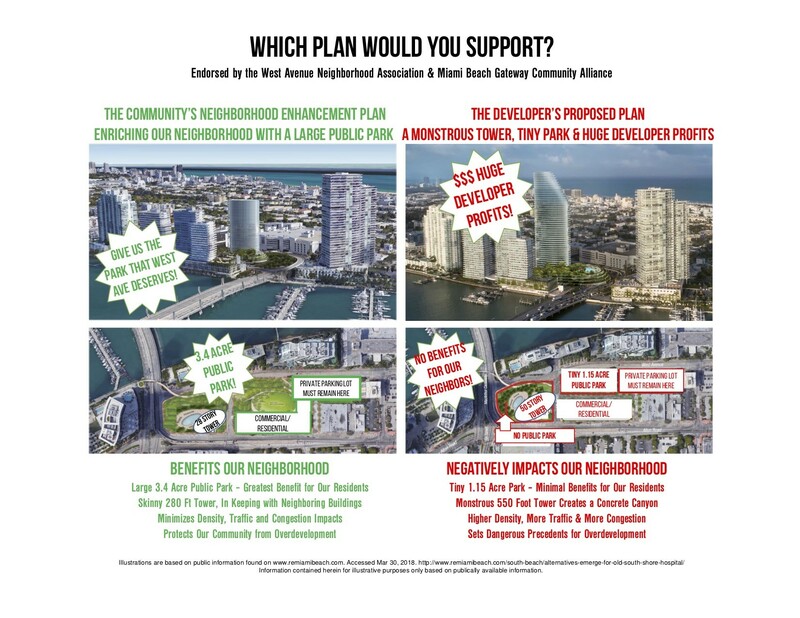 Along with its statement, the group distributed a rendering of the plan it supported (above). In flyers distributed to residents, the group also marked up Fort’s renderings (below), claiming Galbut’s plans would only allow for a 1.15 acre park and not 3.5 acres. 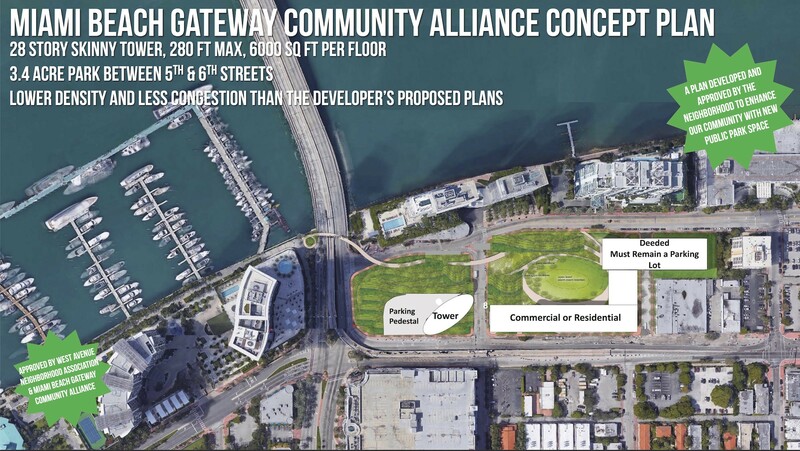 Architect Fort took issue with the group’s markups, saying they misrepresent the size of the park, claiming it would be 1.15 acres with the 50-story tower versus the 3.5 acres the developer says he will deed to the City. In addition, he said, the group “distorted” the footprint of the 50-story building, making it appear larger than the smaller tower options. In reality, Fort said, the footprint is the same, the building is just taller. In an email exchange to attempt to clarify the differences, RE:MiamiBeach received these answers from Gayle Durham, President of the West Avenue Neighborhood Association. “There is another option that is being floated by the developer and some of the neighbors. “If the City would agree to give a variance to allow the Developer to build a taller and skinnier building on the 5th street block (which is currently beyond the Developer’s rights), the Developer would agree to donate most of the remaining land on the 6th and 7th street blocks for a park of between 3 and 4 acres. “From my perspective this plan is intriguing. A tall skinny building will have less residents and many of them will likely not even live here full time. The current development plan will likely have many more full time residents who will further congest the area. And of course there would be no park in [the currently approved plan]. The Developer would have to find a way to accommodate the parking for the Floridian that currently uses a surface lot on 7th Street. “I urge you to engage our Commission and City Staff so we, as a community, can make an informed and thoughtful decision,” he concluded.